Chris has always been both a fighter and a humanist. He learned the importance of fighting injustice early on, in the playgrounds and alleys of Brooklyn, where he sometimes had to settle unavoidable confrontations against bullies with his fists. As an alter-boy and in the Boy Scouts of America, he gained a strong sense of morality and came to love and respect service to others. Later on, as a competitive bodybuilder, he mastered the arts of self-discipline and self-control through intense physical training, long-distance running and meditation. His greatest undergraduate and bodybuilding achievements came in 1990, as he was awarded the title of “Mr. Rutgers University” for his weight class just prior to receiving his B.A. degree in English with highest honors. But it was the fighting spirit and dedication learned in his younger years, along with his exemplary academic performance, that allowed Chris to realize his highest academic honor: admission to one of the nation’s top law schools – New York University School of Law – in 1990. When a person is severely injured because someone fails to live up to their legal responsibilities, they need a local fighter whom they can turn to in their time of need. A fighter who not only knows the law and the legal maneuvering needed to address their problems, but who also understands their pain and the devastation that arises when they are unable to live and work as they have always done before. Chris Trochiano is that fighter. He’s smart, competitive and disciplined, and he works tirelessly and compassionately on behalf of those who trust him to help repair their broken lives. Never downplaying the significance of the hard fought jury verdicts and six-figure settlements he has won, Chris prefers to focus instead on the good he has brought to the lives of countless working-class people, by enforcing their rights and giving them an audible voice. In his products liability case involving a bakery worker who nearly lost her hand in a faulty dough-mixing machine ¬- a case which received media attention in The New York Daily News and The New York Post – and in his suit on behalf of a logger who lost his thumb while using a faulty log-splitter, Chris forced major manufacturers to rethink their safety designs. And in representing a pretty Manhattan fashion worker, whose face was disfigured in a violent taxicab crash after striking the cab’s back-seat partition, he prevailed against the cab company’s stubborn assertion that passengers should have to wear seat belts in the back-seat. 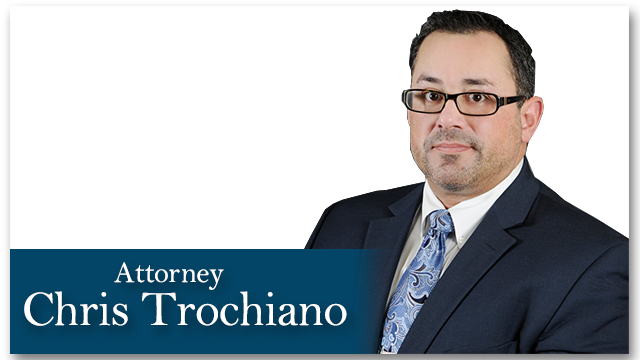 In addition to his legal career, Mr. Trochiano is a residential home builder and entrepreneur who has built homes in Monmouth County, New Jersey, and owned a pair of children’s party gym establishments known as “Kidzone,” in Matawan and Freehold, New Jersey.